← Will Bikes be Welcome on Santa Maria Ave? Having brought my children to Proctor Elementary School for many years, I firmly believe that a deadly accident is waiting to happen on the streets or at the crosswalks around the school. These streets are not only used by students of Proctor Elementary School. The members of the Aitken Senior Center, adjacent to the school, use these streets and crosswalks, as do middle and high school students who come to Proctor Elementary to catch the CVUSD bus to their schools. Let’s have the wisdom to make necessary safety improvements now, rather than waiting until it’s too late. This proposal suggests several changes, most of them minor, that in my opinion would greatly enhance the safety of our students, their parents, and of the greater community at large. These improvements include: real sidewalks along Proctor Rd, no U-turn zone in front of Proctor Elementary School, speed control by adding speed humps or dynamic speed display signs, and increase of crosswalk safety by bulb-outs, flashing lights, and raised and painted crosswalks. Walking to school along Proctor Road (west of Redwood Road), or crossing Redwood Road at the crosswalk is dangerous. Redwood Road is 5 lanes (two traffic lanes, two wide combined parking/ bicycle lanes, one middle turn-off lane). Redwood is the widest street in front of any Castro Valley elementary or middle school. While Lake Chabot Road, which runs in front of Chabot Elementary School is slightly wider, there are signaled crosswalks that provide greater crossing safety for pedestrians than does Redwood Road. Over the years, traffic on Proctor and Redwood Roads has increased; every new house in the neighborhood or around Parsons Park brings more traffic to Proctor and Redwood Roads. With yet more cars driving on these roads several times a day due to the upcoming new Proctor Court development and other in-fill housing construction, the traffic problem will only get worse. Near misses happen regularly. Another issue is that Proctor Road has no sidewalks and walking along Proctor Road is dangerous. Because of the lack of a safe place to walk along Proctor Road, more people are driving their kids, instead of allowing them to walk or walking with them. Of course this adds to the traffic chaos around the school and turns any “walk-to-school” day into a really bad joke. While other schools with less traffic, lower speed limits, and much narrower streets have gotten traffic and safety improvements over the last years, Proctor has yet to see these improvements for our school community. We can either improve the situation around Proctor Elementary School now, or we can wait until someone dies in a traffic accident and do it then. The problem at Proctor is largely ignored and underrated by many people. The risks mainly affect students (who have not yet the ability and voice to take action) and parents coming from the west side of Redwood Road, predominantly at the start and end of the school day. If you only walk along Proctor Road a couple of times, or only during the non-busy hours, likewise if you only cross Redwood Road once or twice when no children or parents are present, you do not understand the magnitude of the problem. Students going to Proctor and crossing Redwood Road, or walking along Proctor Road will typically do that at least 2400 times before they move on to middle school. And they will always do it at the busiest and most dangerous times of the day. In some sections the “sidewalk” is only one foot wide, or does not exist at all. Generally speaking it is dirt, gravel or potholes. Normal strollers cannot navigate the sidewalk. Because there is no clear sidewalk, cars park on it, often blocking the passing of pedestrians and forcing them onto the street. Poles and related items in the middle of the walking path make it worse. Effect: students, toddlers, strollers, parents holding the hand of a small child — they all have to walk part of Proctor Road in the street. To make matters worse, where there is a walking path that is partially or completely blocked by parked cars, families with strollers have to walk into the middle of the street in order to get around the parked cars. This creates a situation where there are parked cars on the sidewalk, forcing pedestrians (children, families and seniors) into the street, and cars coming from behind and from the front at 25 MPH or more. Speeding is unfortunately very common on Proctor Road, despite the speed humps. Proctor Road is relatively narrow, making it ever more dangerous when pedestrians are forced to walk in the road. Close calls happen regularly. Many of the streets leading into Proctor, e.g. Lamson, Joseph, Christy, roads behind Parsons Park, etc. have real sidewalks. Yet in order to walk to Proctor Elementary School safely, sidewalks are needed for every part of the way to school, especially for the most dangerous part, Proctor Road. Speeding along Redwood Road in the Proctor Elementary School zone is common-place. Between the school zone and the Willow Park Gold Course, the speed limit is 40 MPH. Coming up Redwood Road from the High School, the speed limit is 35 MPH. Due to the numerous signal lights between the freeway and Seven Hills Road, motorists often accelerate to 35 MPH or more as they enter the school zone, letting their guard down. They are often not prepared when suddenly there are children in the crosswalk at the intersection of Redwood Road and Buti Park. It is important to also keep in mind that the members of the Aitken Senior Center use this crosswalk as well. Due to the speed motorists are traveling coming up Redwood Rd from either Seven Hills Road or Willow Park Golf Course, and the topography of Redwood Road, it is not always possible to move quickly enough out of the way of speeding and/or inattentive motorists. Too many people make a U-turn on Redwood Road or on the intersection of Redwood Road with Proctor Road, after dropping off their kids. While it may be legal, and less problematic during the day, this becomes an extremely risky maneuver for all the pedestrians and other cars during drop-off and pick-up time at Proctor Elementary School. That whole area is already very busy at these times, particularly in the morning with commuters rushing to get to work. Too many things are happening on the various crosswalks: exits from parking lots, exits from side streets, intersection with Proctor Road. Add into that mix a car making a U-turn, forcing other cars with the right of way to stop or taking the cars turning onto Redwood by surprise, and you get a potentially deadly situation. Unfortunately, motorists executing the U-turns are not necessarily endangered, and do not seem to understand the dangers and risks to pedestrians and other motorists. Too many people stop in the red zone to drop-off or pick-up students. 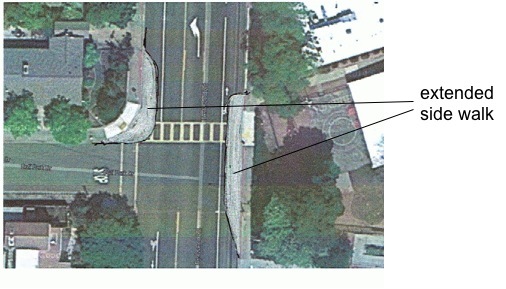 This increases the chaos, and hampers the view of drivers and pedestrians around the crosswalk. They also reverse from the red zone into the crosswalk at the intersection of Redwood Road and Buti Park, backing into the pedestrians! This happens so frequently that the crossing guard has recently put an orange cone there. The cone has not yet proven a deterrent. The crosswalk at Redwood Road and Buti Park Drive is simply NOT noticeable. The crosswalk is near the crest of Redwood Road, which is within the Proctor Elementary school zone. Due to the crest, motorists traveling southbound do not see the crosswalk or any pedestrians in the crosswalk until they are over the crest. Lighting issues also impact visibility. During the early morning drop off or in the evenings during school events, the low level of natural or street lighting makes a pedestrian in the crosswalk almost unnoticeable. Low level fog that also often sits at the crest of Redwood Road creates an added obstruction to a motorist’s ability to see a pedestrian in the crosswalk or a pedestrian’s ability to see a speeding motorist. Crossing at the intersection of Redwood Road and Buti Park Drive, when no guard is holding a stop sign, is not safe. Drivers do not stop, often not even when the pedestrian waves his/her arms. Most motorists appear to be completely unaware that the crosswalk exists, or perhaps they feel they don’t have to stop when there is no guard present. Similar issues exist at the two crosswalks crossing Proctor Road at the intersection with Redwood Road. Drivers simply do not see these crosswalks. Or they ignore them and the pedestrians trying to cross. Install paved sidewalks, reduce the number of poles blocking the way, no parking allowed on the sidewalks. Make Redwood Road in front of Proctor Elementary a no U-turn zone, from the driveway of the Kenneth C. Aitken Senior Center until after the crossing with the east section of Proctor Road. Install No U-turn signs. Also add no U-turn signs to the two stop signs at the intersection of Proctor Road with Redwood Road. Ask police to ticket enough people until motorists understand that the new rule has to be taken seriously. Other schools have no U-turn signs though they have fewer side streets, fewer driveways into parking lots (Proctor school and the Senior Center have three parking lots within a short distance, all allowing left turns when exiting onto Redwood), fewer lanes, and a less complex traffic situation. Why not Proctor? Install two solar-powered dynamic speed display signs on Redwood Road, one for traffic heading south from the golf course, one for traffic heading north. They are actually effective, and are easy to install. Ideally it would be a sign that could operate at two different speed limits: 25 MPH during drop-off and pick-up times, 35 MPH during the rest of the day. Install speed humps on Redwood Road at both ends of the school zones. Add flashing lights to the crosswalk across Redwood Road. These will get activated when somebody crosses, by the push of a button. Flashing lights should be added at least to the signs on the sides, ideally also along the entire crosswalk in the roadway. An alternative would be a regular traffic light at the crosswalk. This traffic light would only turn red whenever a pedestrian wants to cross. Paint the crosswalk in bright colors (red/white) so it can be noticed by cars coming over the crest. Maybe turn crosswalk into speed humps with brighly colored edges. Install either Botts Dots or rumble strips to the north and south of the crosswalk (where “school x-ing” is painted on roadway), to ‘awaken’ drivers with the tactile vibration. Examples: Marshall and Castro Valley Elementary have flashing lights, and these schools are on significantly narrower roads with slower speed limits. Make all crosswalks also a speed hump, and repaint with ladder or red/white striping. Shorter crosswalk, less risk (three lanes instead of five). Pedestrians are through the crosswalk faster, arriving safely on the other side before new traffic appears out of nowhere (poor visibility/ blind spot from north due to crest). It is easier for drivers and pedestrians to overview the whole crosswalk, enhancing driver ability to see pedestrians crossing. It is easier for cars to spot the crossing guard (currently the crossing guard gets somewhat lost on these many, many yards of crosswalk). It is easier for the crossing guard to step quickly into the middle of the road, and to oversee all of it. The signs and flashing lights for the crosswalk will be within the field of vision of the drivers, not so far out to the right that no driver will see it. The curving of the sidewalk also helps to catch the attention of the driver. Prevents cars from illegally parking in, or misusing the red zone as a drop-off and pick-up zone (parked and/or idling cars in the red zone block the view towards oncoming traffic and make pedestrian crossing really dangerous). Prevents these illegally parked cars from reversing into (and hitting) pedestrians that are in the crosswalk. Prevents drivers from using the white zone loading lane for driving and passing. It will stop cars from passing through using the far right lanes even while the guard is holding a stop sign in the middle of the road. No parking spaces get lost, as this is a red zone, so no cars are allowed to be there in the first place. Bicycle lanes must remain.The bulb-outs should be as wide as parked cars, and cover the parking portion of the combined lane. Humans have the tendency to overreact to new and hyped-up dangers. They tend to complacently accept old dangers, especially when it means work and inconvenience to reduce that danger — until something bad happens. If someone were to get killed due to the traffic and safety issues near Proctor Elementary School, everybody will say: “Why has nobody done anything? Why have they all ignored the signs and evidence for so many years?” There are high risk traffic situations on a daily basis. There are near misses and close calls weekly, far too many of them to count. Unfortunately, no one keeps accurate track of them; the crossing guard is expected to do so, but has stated that it is impossible to take photos, write down license numbers, etc. while trying to get students and parents safely across the street. The crossing guard also only has access to the vantage point at the intersection of Redwood Road and Buti Park. There are several hundred people crossing the crosswalks or walking along Proctor Road each day, so while each individual may have but a few close calls each year, it all adds up. Anyone who has an understanding about risk management and risk mitigation knows that where there are so many risky behaviors, so many close calls, a real accident happens sooner or later. In this case, a real accident means a car hitting a pedestrian, and the outcome could be disastrous or even fatal. Some of the proposed measures will be more complex to implement (e.g. sidewalk), others will be much more straightforward (e.g. no U-turn signs, speed displays, pedestrian activated flashing lights). Depending on how the processes work for getting these measures into effect, it might make sense to divide them into two or three phases, and implement them incrementally. Ultimately, though, all of these measures are needed in order to improve traffic safety around Proctor Elementary School to an acceptable degree.